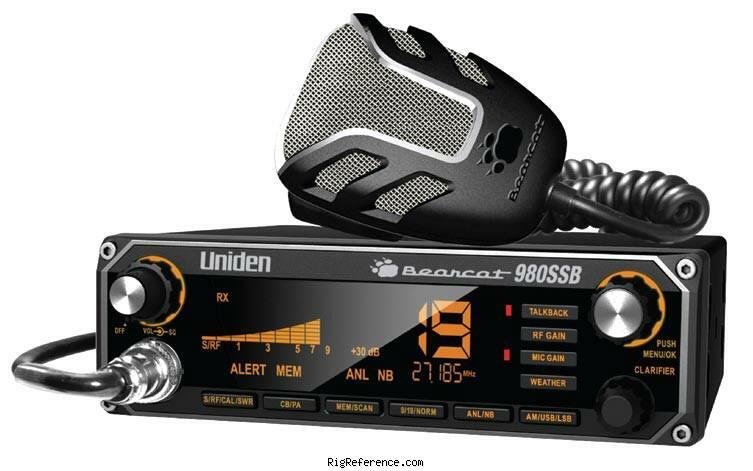 The Uniden Bearcat 980SSB 40 channel CB radio operates in the normal AM mode and Single Sideband Mode (SSB). It features a stunning front panel with seven color selectable display back lighting. Plus you can adjust brightness and contrast independently. Everything for easy mobile operation has been considered and the 980SSB controls are easy to use. This radio even has a built-in diagnostic system that can check the antenna match, RF power and supply voltage. Other features include S/RF/CAL/SWR Meter, NOAA weather, frequency display, clarifier, noise blanker, mic gain, all channel scan, memory scan, RF gain, instant channel 9/19 and extra long mic cord. There is a PA - Public Address function if you add an external PA speaker (sold separately). The Bearcat 980 is pre-configured for Uniden’s 6-pin wireless, noise canceling technology. Your Bearcat 980 comes with an adapter to connect the radio’s 6-pin microphone to a standard 4-pin microphone. The rear panel features a jack for external speaker and a jack for public address audio output. This radio comes with a 6 pin, wired noise-canceling mic, mobile bracket, DC power cord and mic clip. 6.3 x 2.2 x 6.3 inches. This radio requires 12 V DC at 2.2 Amps. Two year limited manufacturer's warranty. Estimating the value of a rig can be challenging. We collect prices paid by real hams over the years to help you estimate the current value of the Uniden-Bearcat 980SSB. Just bought or sold this model? Let us know what you traded it for and help other ham operators!